The ESCO Trademark II Series Intercoms come with either an 8 or 20 speaker interface. These systems are easily upgradeable to up to 16 or 32 speaker stations by adding optional 4 Speaker I/O Cards. The base system uses a single Desktop Controller with the ability to attach 15 more. Its two voice channels allow communication with two speaker stations at once. 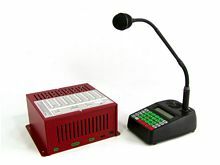 The Digital Interface Box provides a convenient location for speaker and call switch terminals. Six month limited warranty.